The Custom Estates neighborhood at Old Palm, where homes range from 7,000 to 15,000 square feet, offers an opportunity to build an exquisite home that reflects the homeownerâs personal tastes and sensibilities while incorporating the best of todayâs luxury trends. 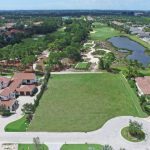 The time to select a one-acre custom estate lot with fabulous golf and water views and an approved builder to design your Dream Home in the Custom Estates of Old Palm is now. Todayâs luxury home trends include features that reflect green living with an eye towards sustainability, as well as integrating smart technology into the design. Here are a few trends we love from todayâs design magazines and websites: Bringing the outdoors in Well-appointed outdoor living spaces with top-of-the line summer kitchens, showers, fireplaces and entertainment areas have been prominent for a few years. The latest trend brings the outdoors in. Indoor gardens and water features are showing up everywhere, particularly with an emphasis on health and wellness. Floor-to-ceiling glass walls and sliders that allow for a complete integration of indoor-outdoor living make sense in Florida, and elegant renditions can be worked into virtually any designâfrom traditional to Mediterranean to mid-century modern. Courtyards, vegetable or Zen gardens, and waterfalls can be in, or out, or both. Pale kitchens While white is still a popular choice for beautiful kitchens, muted earth tones in blues, greens and browns are making a fabulous showing. Pale gray-green is particularly attractive and, when paired with an indoor herb garden, may make it possible to move all the way past merely gorgeous to pure kitchen nirvana. Matte finishes on appliances and quartz countertops are taking center stage for their easy care and livability factors, further lowering stress levels. Designing an aesthetic, custom kitchen fit for a gourmet chef, a legendary hostess, or a busy family has never been more fun. Magnificent master suites Large, walk-in closets with custom dressing areas and fine wood built-ins are de rigueur, as are spa-like master baths featuring freestanding tubs, furniture grade vanities, and spacious showers with multiple showerheads. Steam showers are also becoming quite popular. Making oneâs personal space comfortable to the point of indulgence is absolutely on point. A particularly interesting trendâand this is really a recycle of what was once standard for master suite configurations in fine manor homes and castles of the pastâis the addition of a second bedroom within the master suite. Some designers refer to it as the âsnoring room.â Weâll just say itâs an idea long overdue for a comeback and leave it at that. Perhaps a wine cellar is in order. Or, a home theater worthy of hosting an âOscarâ party. Whatever your idea of a Dream Home may be, there are still a very few custom estate lots remaining at Old Palm Golf Club where you and your approved custom builder can make the dream a reality.